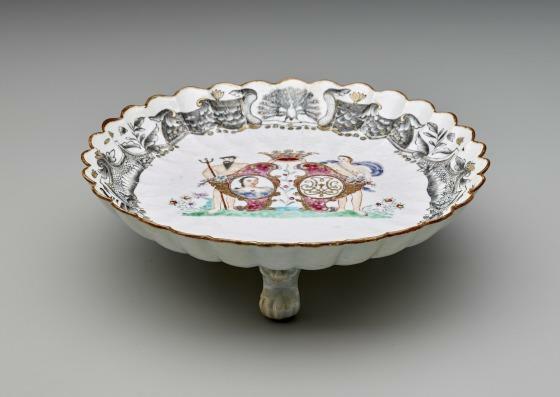 In the 18th century, Denmark traded extensively with Asia, importing numerous porcelain dinner services. Significantly, this design includes a ship at bottom center, as well as a portrait and cipher of Queen Juliana Marie, who married King Frederick V of Denmark in 1752. The central reserves are supported by the sea god Neptune and Aphrodite, who was born on the sea. Both hold scrolled shields bordered by flower-filled cornucopia. The left shield contains a portrait bust of Queen Juliana Marie who married King Frederick V of Denmark in 1752; the right shield displays her cypher. 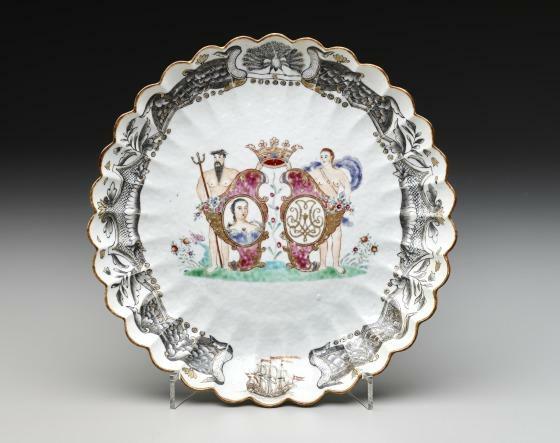 The depiction of Neptune and Aphrodite, in conjunction with the ship that bears Denmark's flag on the lower rim and the regal peacock at the top, symbolize the prowess of Denmark on the high seas and the beauty of her queen. 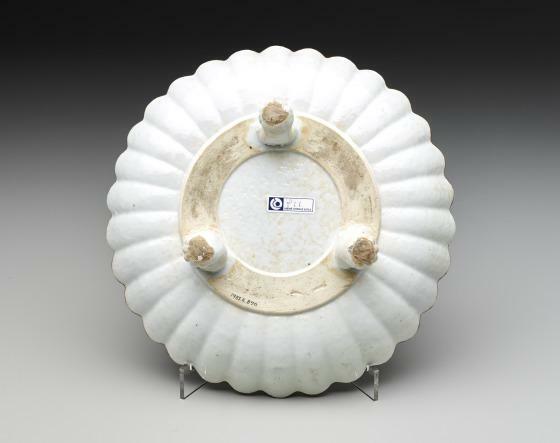 This tazza (footed dish with an upturned rim) is fluted to suggest a shell. The three squat paw-footed legs with lion masks are tame reminders of the heraldic lions supporting earlier Baroque furniture and smaller objects, such as the Reves' Danish Baroque silver tankard (see 1985.R.569). 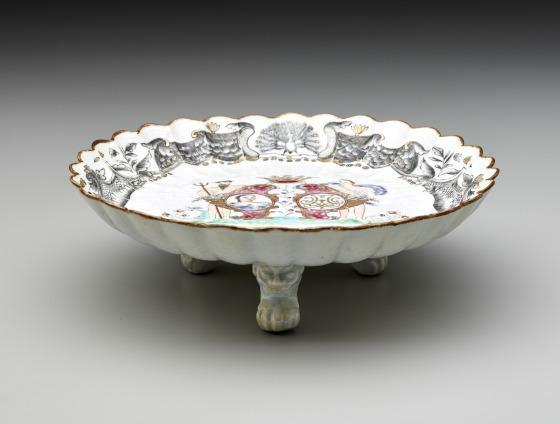 Although many examples from this service survive, the Reves piece is rare because of its form. Tazzas were used on European dining tables to hold a variety of foods. Dallas Museum of Art, Decorative Arts Highlights from the Wendy and Emery Reves Collection (Dallas, Texas: Dallas Museum of Art, 1995), 108. Dallas Museum of Art, The Wendy and Emery Reves Collection (Dallas, Texas: Dallas Museum of Art, 1985), 202.